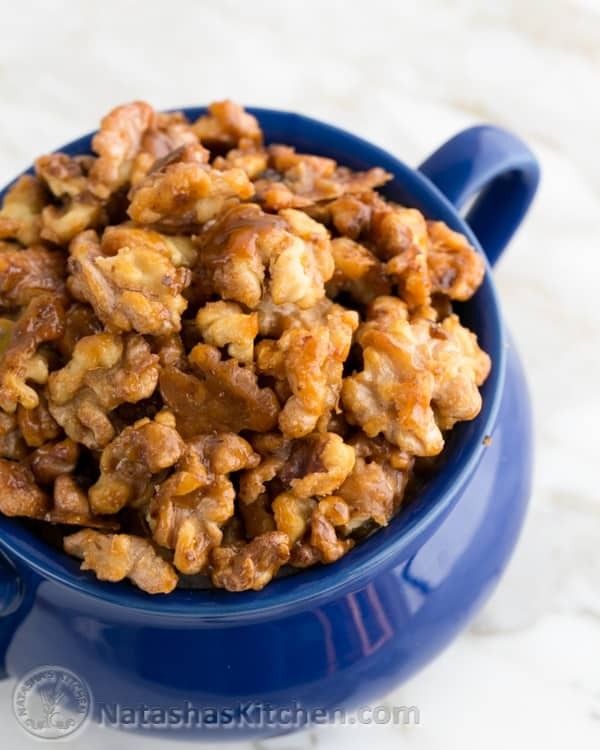 These caramelized, candied walnuts are quite a treat. Toss them into your salad, over popcorn, or straight into your mouth. Crunch. Crunch. I love this easy method of making the candied nuts where everything goes into the pan at once. Other methods I’ve tried left me with globs of candy on the nuts rather than a more even coating. It also roasts the nuts at the same time so you don’t have to pre-toast them, then add them back to the pan to be coated, blah, blah. Who needs extra steps? It seriously takes about 5 minutes on the stove and 5 minutes to cool. The finished product is delicious! My husband was sampling them right out of the pan. P.S. This recipe can easily be doubled. 1. 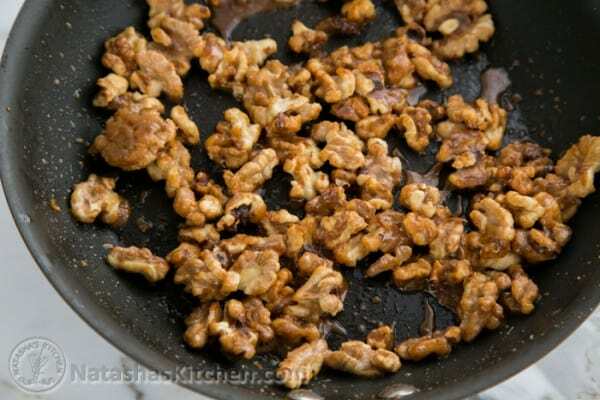 Heat a medium non-stick skillet over medium heat, add 1 cup walnuts, 1/4 cup granulated sugar and 1 Tbsp butter. 2. Heat over medium heat for 5 minutes, stirring frequently (with a heat proof non-plastic spatula) so your mixture doesn’t burn (especially towards the end). When the sugar mixture starts melting, stir constantly until all sugar is melted and nuts are coated. 3. 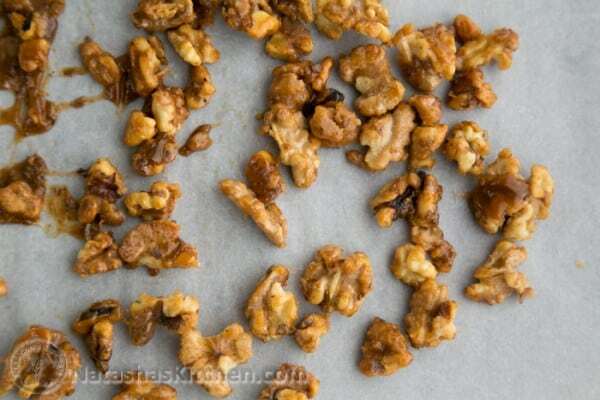 Transfer immediately onto a sheet of parchment paper and separate the nuts right away. Using two spatulas will make this task go faster. 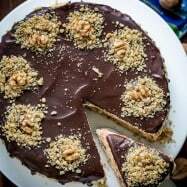 You don’t want to give the nuts a chance to turn into a wad of inseparable delicious goodness unless you are the only person who will be enjoying the wad ;). Seriously, move quickly from the time the nuts are coated until they are separated out on the parchment paper. Once the coating hardens (5-7 minutes), you can transfer them to a bowl and either inhale them right then and there or save ’em for a salad or something. Toss these caramelized walnuts into your salad, over popcorn, or straight into your mouth. Crunch. Crunch. I love this easy method of making the candied nuts where everything goes into the pan at once. Other methods I've tried left me with globs of candy on the nuts rather than a more even coating. It also roasts the nuts at the same time so you don't have to pre-toast them, then add them back to the pan to be coated, blah, blah. Who needs extra steps? It seriously takes about 5 minutes on the stove and 5 minutes to cool. P.S. This recipe can easily be doubled. 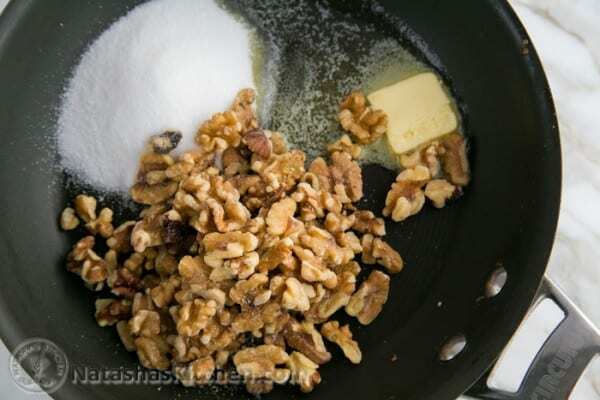 Heat a medium non-stick skillet over medium heat, add 1 cup walnuts, 1/4 cup granulated sugar and 1 Tbsp butter. Heat over medium heat for 5 minutes, stirring frequently so your mixture doesn't burn (especially towards the end). 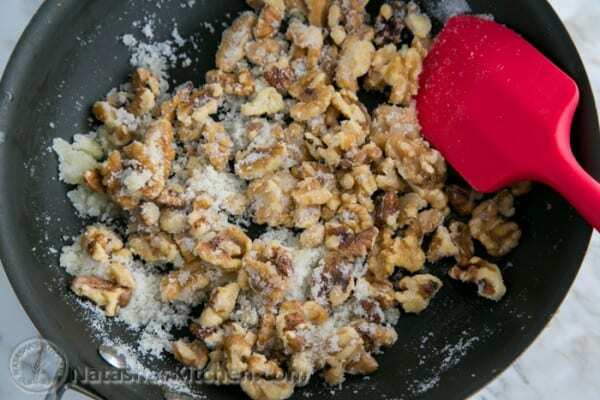 When the sugar mixture starts melting, stir constantly until all sugar is melted and nuts are coated. 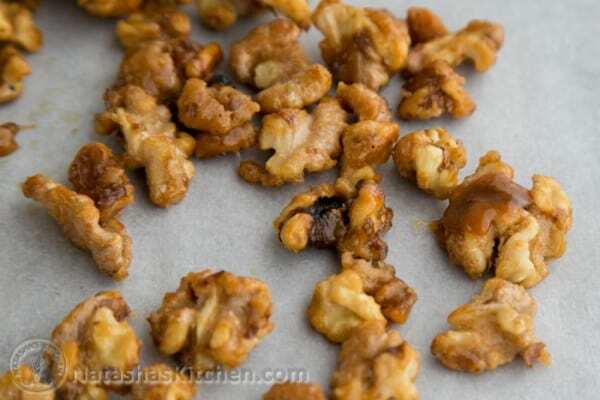 Transfer immediately onto a sheet of parchment paper and separate the nuts right away. Using two spatulas will make this task go faster. 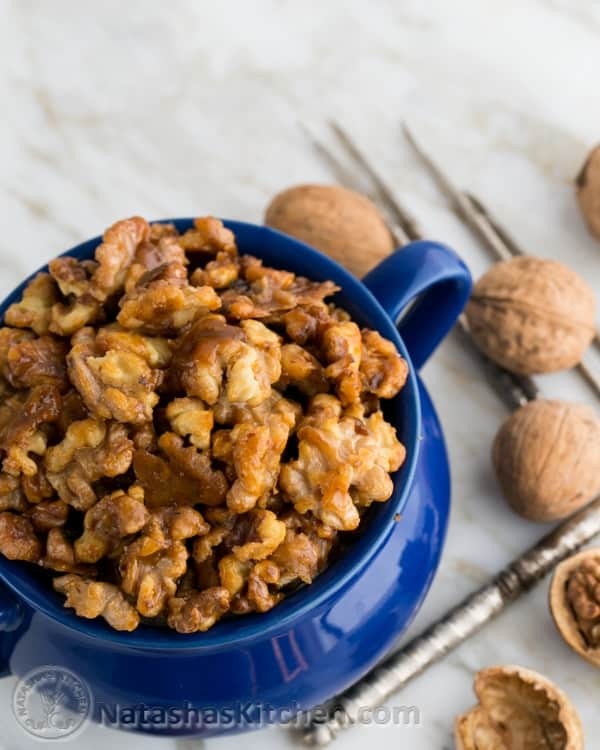 You don't want to give the nuts a chance to turn into a wad of inseparable delicious goodness unless you are the only person who will be enjoying the wad ;). Seriously, move quickly from the time the nuts are coated until they are separated out on the parchment paper. Once the coating hardens (5-7 minutes), you can transfer them to a bowl and enjoy! Fabulous idea to add some water! I went looking for a recipe for candied walnuts to top a salad and loved the fact that this receipe could be done in 10 minutes. My whole family loves them. I have made them for my parents and sister who loved them and have asked for them as Christmas presents. 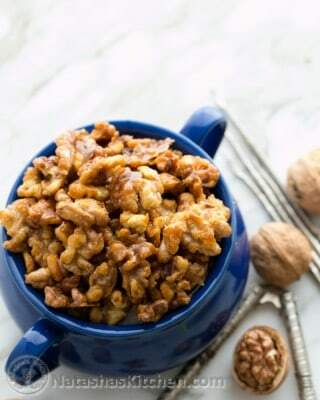 I have mixed walnuts and pecans together with great results. This recipe is a great easy way to candy nuts! I added a dash of nutmeg and a dash of salt. I make these with a sugar called Allulose to keep myself in ketosis. I add a tablespoon or two of bourbon and stir till it burns off or I’ve added cocoa powder, with or without the bourbon, all good. Hard to go wrong with nuts and sugar! Stumbled on the recipe from Pinterest. 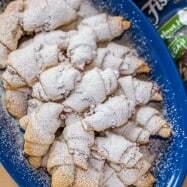 Yummy as is, family ate them right off the wax paper! Next time will try the brown sugar and cinnamon combo. Can’t get any easier. And no reaching in the oven every 5 minutes to stir! I think i have made this five times in the past two weeks. i just completed a double portion. A wonderful recipe. 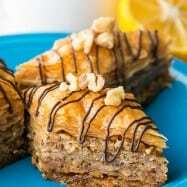 I made your recipe today, using pecans, walnuts and pistachios, so yummy. I like that you make it on the stove top, they are delicious. 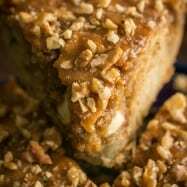 I like using them in salads and desserts that call for a nut topping, having them candied instead of plain adds a nice taste. 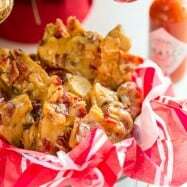 I made this recipe several times and I love it. My friends also love it. Had a LOT of walnuts left over from buying for another recipe, so thought I’d give this a go before they went rancid in the fridge. Worked well, but I think I added a bit too much butter (maybe Australian tbs are different to yours). They were a bit more toffeefied, but were still lovely, and the toffee bits were actually an added bonus. I just made these and they are still warm, well, the couple that are left are 😉 They are so easy and quick to make and scrumptious! 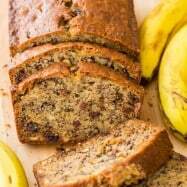 Great recipe – so easy! I used Earth Balance, a non-dairy spread, and half and half Lakanto (non-caloric sweetener) and sugar. I melted Earth Balance first, mixed in sugar, then added walnuts. Set timer, stirred often, and they were ready in 5 minutes over medium high heat. Thank you for this. Do you think i can use canola oil instead of butter-am trying to avoid using milk produce. OMG!!! This is so fantastic!! Made a batch yesterday,gone!! Just made a double batch this morning.